Rinse strawberries; pat dry with paper towels. Line cookie sheet with waxed paper. In medium bowl, beat cream cheese, cookie crumbs, powdered sugar and orange peel with electric mixer on medium speed until mixed. Press about 1 rounded tablespoon cream cheese mixture over bottom half of each strawberry, molding to fit the strawberry. Place on cookie sheet. Refrigerate 30 minutes. In 1-quart saucepan, melt semisweet chocolate chips and bittersweet chocolate over low heat, stirring frequently. Holding strawberry by the leaves, dip each strawberry into chocolate mixture, covering cheese mixture. Place on cookie sheet. Refrigerate about 30 minutes or until chocolate is completely set. In small microwavable bowl, microwave vanilla baking chips and oil uncovered on High 1 minute, stirring every 30 seconds, until melted. Continue to microwave at 15-second intervals if necessary to melt chips. 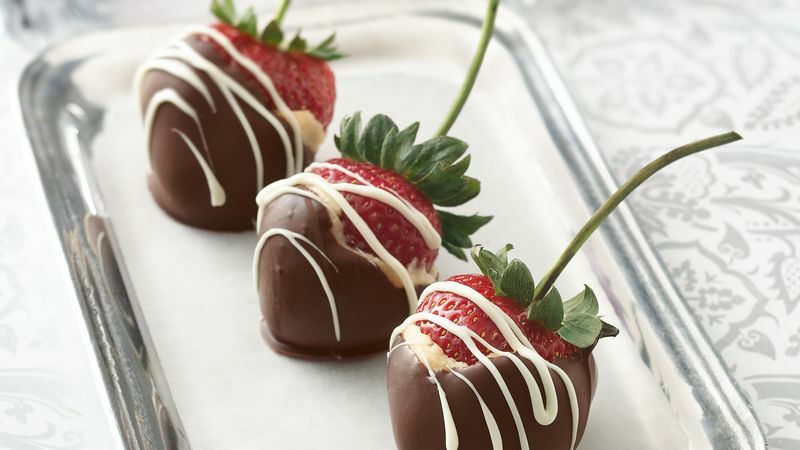 Drizzle melted vanilla chips over dark chocolate on strawberries. Place each in paper baking cup. Store in tightly covered container in refrigerator no longer than 24 hours. Long-stemmed strawberries can be substituted for the regular strawberries.